* Hazel empties my downloads folder and puts the movies in my movies folder, pictures in my picture folder, and music in my iTunes library. * Hazel clears out my media-heavy temporary files such as soundtrack and movie temp files once a week. * I have one folder on a password encrypted sparse image drive that is the recipient of my scanned documents. When I ask Hazel to clean that folder, it takes each pdf and moves it to a sub folder organized by month and year. If it needs too, Hazel will create a new monthly folder. I’ve really only scratched the surface with my usage so far. Hazel can also set color labels and add Spotlight comments. It can even rename your files. It integrates with the iLife library allowing you to send files into iPhoto and iTunes. 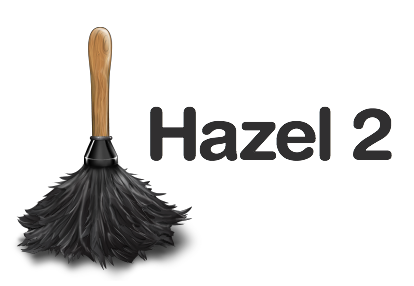 If you are trying to break yourself of the habit of accumulating files on your desktop, Hazel can lend a hand. These are just a few examples of what Hazel can do. Lately, whenever I catch myself doing repetitive file management tasks, I end up making a Hazel rule to get that bit of drudgery out of my life. 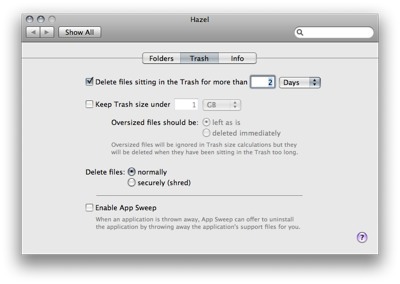 If you don’t already have a program to delete applications, like AppZapper, Hazel has a feature called AppSweap that sniffs out related files when you go to delete an application. I really enjoy using my Mac. I want to spend that time, however, getting my work done or having fun making music or working on the MacSparky blog. Hazel helps you cut down on the time spent doing computer housekeeping and more time for the fun stuff. My review was of version 2.1.1 which is universal binary. Hazel can be downloaded at Noodlesoft.com for a free 14-day trial. A full license will cost you $21.95. However, Paul agreed to give a 10% discount to MacReviewCast listeners and MacSparky readers for the week of December 1-8, 2007. Just enter the coupon code MACSPARKY. Now is your chance!